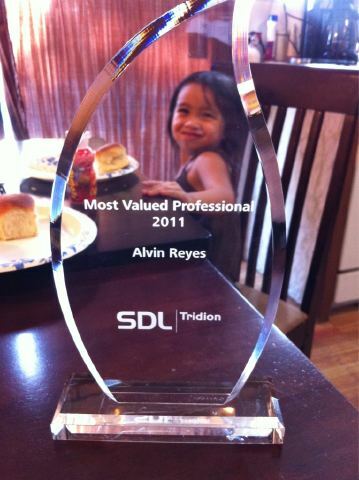 Not to be confused with the SDL Tridion Favorites Feature, here's my favorite parts of 2011. I had the opportunity to run some "real" projects with American Specialty Health's IT Operations as a PM. It was a little déjà vu working on a WFM (not WCM) purchase with a similar scope, budget, and the fun challenge of balancing IT, business, and project needs. I feel I did well in the vendor-facing PM role, but I tease my consulting peers that I "got tired of vendors... so I joined you guys." If you're a mid-to-senior knowledge worker that gets a chance to work for American Specialty Health, go for it. Try to get into a position that involves projects and/or writing within any of the departments that interest you. Positions open on their corporate site. Tell them I sent you (no actually tell them Christy, the proposal manager (RFPs) sent you, yes she'll split any referral bonus with you). Here's my finalist video at my last job. Wow. I tell everyone contributing works. Seth Godin was right. Don't mind the cute toddler. I'm sure she'll ask me to take this down when Google bot or its equivalent in 2020 keeps bringing up my old award in searches for her. A benefit of the MVP program is a test software license and occasional invites to partner training events. I had to pass up the no-expenses-paid invite to the Amsterdam Bootcamp, but instead went to San Jose to meet my unknown-at-the-time future coworkers, learn about extensions and the revised event system, and enjoy a few days of Tridion geekery. As much as I like how "Bachelor's of Science in Information Technology, emphasis in Business Systems Analysis" sounds, it's simply an IT degree (or BSIT-BSA). My toddler won't be able to grow up and have an excuse to skip college, well at least not the one that goes "Daddy didn't so I don't have to." University of Phoenix may not be the most prestigious school, but it's a legitimate program that gave me a chance to run 20 ad hoc 5-person teams through one (or more) 5-week projects with 2 to 3 electronic deliverables (assignment, requirements, etc) and presentations in front of a live audience, complete with last-minute meetings, project changes, and the occasional slacker (or cheater). Hey that's actually pretty good training for IT or consulting work. The chance to meet other professionals in the industry and make a few friends was worth the student loans. Nothing like meeting your personal heroes to find out they're cooler in person and not as scary as you'd think they were based on scary-seeming feedback on the apparently oh-so-scary TridionWorld. Dominic Cronin is a complaining curmudgeon-teddy bear. Nuno is as cool as you'd think he was. And Jeremy Grand-Scrutton, aka Tridion Fan Boy, is not the distinguished older gentleman with an English accent that I imagined him to be. He's a much younger, distinguished, and helpful tech/sales/everything Tridion guy with the English accent. The retreat was quite productive, and I haven't seen this much collaboration between internals, externals, and various levels of consultants and customers. 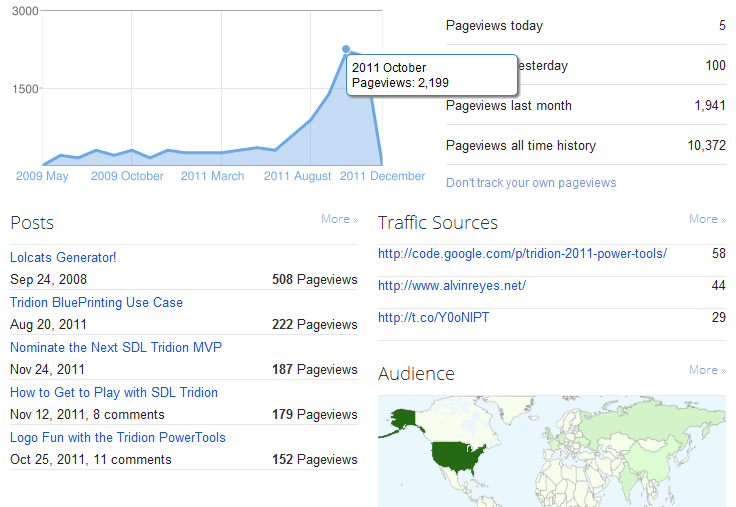 Actually coming from the customer side, I have no idea of what it was like before, but I hear 2011 has seen an increase in the technical community's involvement. Go participation! It's never too late to join the SDL Tridion PowerTools group; say "hi" on the discussion forum and we'll get you situated. 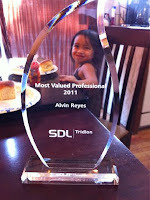 No SDL Tridion coding experience required; we're still short on functionals, testers, analysts, and designers. Don't mind the 1980's American commercial (Power Wheels) joke in this subtitle. 4. New Job. New City. New Peers. Except the higher cost of living and colder winter temperatures I'm used to, I'm excited to live in Silicon Valley, working with other Tridion geeks while connecting to a World-wide network of Tridion geeks. /me likes the ability to collaborate with others via Skype. /me found the hidden emoticons. /me enjoys speaking about himself in third person. /me is watching @puf remind others to get back on task. Whoa, that's a lot of tech. 2. Blogging. Lots of Blogging. I now earn about $4.89 annually (via AdSense) as a not-quite-professional blogger. I'm glad I do this out of some strange combination of being compelled to share and because those immediately around me can only take so much spam. This unpaid endeavor (Google Adsense doesn't pay until you've earned $100) keeps me honest and prevents this from becoming "work." 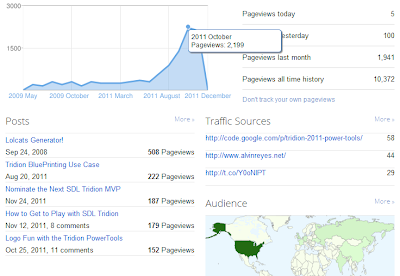 Thanks much for reading this far, expect more basic and advanced topics in 2012. My top all-time-post has nothing to do with Tridion. Family members that moved to San Jose with me had opportunities to work remote, continue school, or start a new career. The toddler gets to stay home a little longer. Awesome. Happy New Year and thanks for reading. You don't have to write a long novel of a blog post, but your favorite 2011 moments are welcome in the comments!